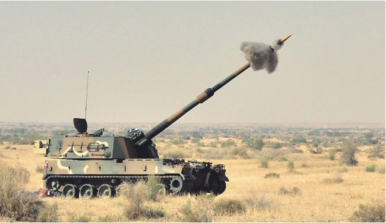 The Indian Army will take delivery of the first batch of ten K-9 Vajra 155 mm/52 caliber self-propelled tracked howitzers this month, along with other military hardware including U.S.-made M777 155 mm 39-caliber towed howitzer guns, according to an Indian Ministry of Defense (MoD) spokesperson. An official induction ceremony for the first K-9 Vajra and M777 howitzers will be held at Indian Army Artillery School, located in Deolali in Nashik district, Maharashtra, on November 9, The Economic Times reports. The ceremony will reportedly be attended by Indian Defense Minister Nirmala Sitharaman. South Korean defense firm Samsung-Techwin, along with its local Indian private-sector partner Larsen & Toubro (L&T), signed a contract for the sale of 100 modified K-9 Vajras in May 2017. Induction of all 100 howitzers is expected to be completed by November 2020. The next 40 K-9 Vajras will be delivered in November 2019 with the last batch of 50 slated to be inducted by November 2020. The Indian Army will also take official delivery of the first M777 155 mm 39-caliber towed howitzer gun tomorrow. (Five howitzers were delivered to India for user trials in 2017 and 2018, respectively.) In November 2016, India approved the procurement of 145 air-mobile M777 howitzers from BAE Systems at an estimated cost of $750 million under the U.S. Department of Defense’s Foreign Military Sales (FMS) program. The Indian Army will stand up seven M777 regiments, with the first unit expected to be operational by the end of October next year. Beginning in August (some source indicate March) 2019, five M777s will be delivered each month with the entire order completed by 2021. Of those, 25 guns will be directly imported in ready-to-use condition from the United States. The remaining 120 M777s will be assembled in partnership with Mahindra Defense at a BAE Systems Assembly, Integration, and Test facility in India.